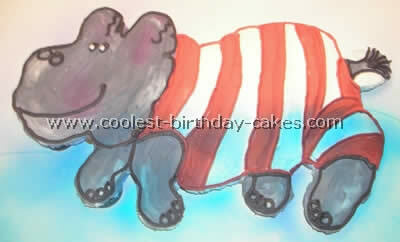 This birthday cake design is a Hippo cake for my Hubby’s birthday! I made three sheet cakes, piled them on top of each other and carved the hippo out of the cakes. 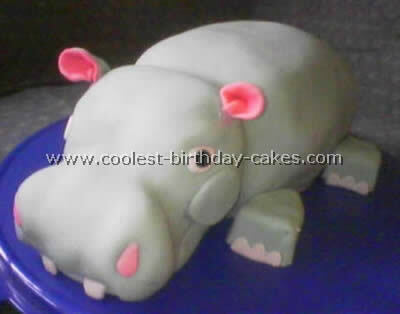 I colored white fondant with black icing dye to make the grey color and just rolled it over the cake and smoothed it into the hippo shape. 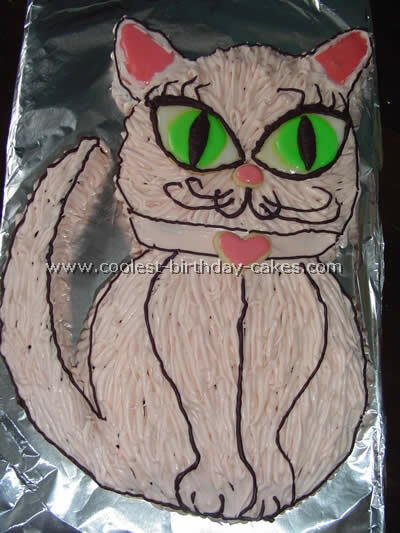 I made this birthday cake design by baking 40 cupcakes. I sliced the top of each one to make them flat and arranged them in the shape of a hippo. It was a mascot for a local swim school a friend takes her son to for lessons. I frosted the top of all of them like a cake and then decorated it to look like a hippo in a swimsuit. I sprayed Wilton blue color spray to look like the water. 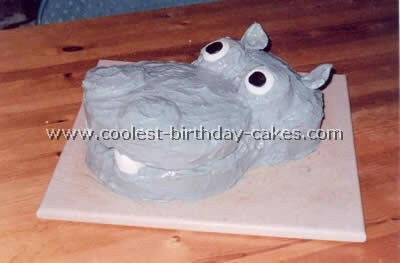 For my two year old I made a Hippo birthday cake design. He is crazy about Hippos. I used a couple of 8 inch rounds for the mouth, a 4"x 9" loaf with the corners rounded for the back of the head, the tops of cupcakes for the nostrils and the bases for the eyes. Large marshmallows were used for the teeth and ears. For the frosting I used the cool whip fluffy frosting (8 oz cool whip, 1 small package of vanilla pudding, 1 cup milk and 1/4 cup confectioner’s sugar) tinted with black and red food coloring. 1) Take 1st 8" round. I frosted top with pink (for inside of mouth) and around edges with grey. 2) Place 2 large marshmallows at edge of mouth spaced a few inches apart. You may want to secure these with skewers through the marshmallow and cake. 3) Place 2nd 8" round on top so that marshmallow teeth prop it up on one side. If you find the top layer slips, skewers cut to size through both layers will secure it. 4) On opposite end of round from the teeth place loaf. Trim the outer corners rounder and use these pieces to fill in the gaps between the round and the loaf so you have a smoother shape. 5) Cut rounded tops off of cupcakes and glue them with frosting onto the top round roughly over where the teeth are. 6) Put the cupcake bottoms on the loaf touching the rounds for the eyes. 8) For ears cut a large marshmallow diagonally, flatten and shape into an ear-shape and affix with toothpick. Frost to match color. 9) For eyeballs I used decorator icing in white and black (the kind that comes in the tubes). Putting a dollop on a small square of wax paper then pushing another square of wax paper over it (so it’s about 1/8" thick and makes a perfect circle). 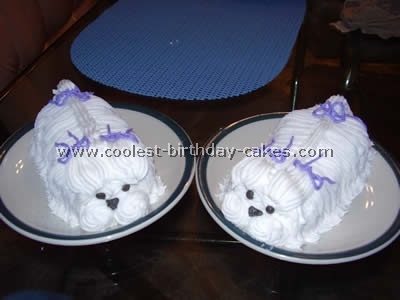 I freeze these so they’re easy to handle, peel off the wax paper, and place on the cake.